This is the story of the killing or disappearance of several groups of the Liberation Tigers of Tamil Eelam (LTTE) who surrendered to the Sri Lankan army on or about 18 May 2009 at the end of Sri Lanka’s civil war. They were told by the government if they carried a white flag they would be safe crossing the frontline. But when they surrendered it became apparent they had been lured into a trap.Several were executed in cold blood - others have never been seen since. The surrender of the political leaders of the LTTE - Pulidevan and Nadesan - is commonly known as “the white flag incident”. It involved approximately twelve people surrendering, including the leaders. Photographs of their dead bodies later appeared. There was however more than one white flag incident. At least 103 other LTTE leaders and those associated with them were seen later that day surrendering while unarmed. Some were led by an elderly Catholic priest called Father Francis Joseph; witnesses saw them loaded onto a bus under army guard. They have not been seen since and are presumed to have been disappeared by the Sri Lanka security forces. An analysis of the available evidence points to an organised government plan at the highest level not to accept the surrender of the top civilian, administrative and political leadership of the LTTE - but rather to execute them. In the immediate aftermath of the surrenders, the Sri Lankan government presented a number of contradictory explanations for the killings of the political wing leaders but none for the other people who disappeared. Five years on, the families of the disappeared and dead desperately need to know what happened to their loved ones and why. The white flag incident allegedly involved several very high level Sri Lankan officials. The President’s brother, Basil Rajapaksa, allegedly took the lead in the negotiation of the surrender of the political leaders. He reportedly had the surrender deal approved by his siblings - President Mahinda Rajapaksa and the defence secretary, Gotabaya Rajapaksa. The Permanent Representative to the UN mission, Palitha Kohona, who was then foreign secretary, is alleged to have played a key role, sending text messages to the LTTE with instructions on how to surrender safely. An eyewitness saw Shavendra Silva (seen in the next photo pointing at the corpses) accepting the surrender of the political leaders. Silva is now Mr Kohona’s deputy at the United Nations. Shavendra Silva pointing at the bodies of other dead LTTE fighters, standing next to Army Commander, Jagath Jayasuriya in camouflage and on his other side Major General Jagath Dias (later to be deputy Ambassador to Germany). This report is compiled based on new evidence in addition to existing evidence gathered from a range of sources including the UN Panel of Experts, ICEP and media reports. 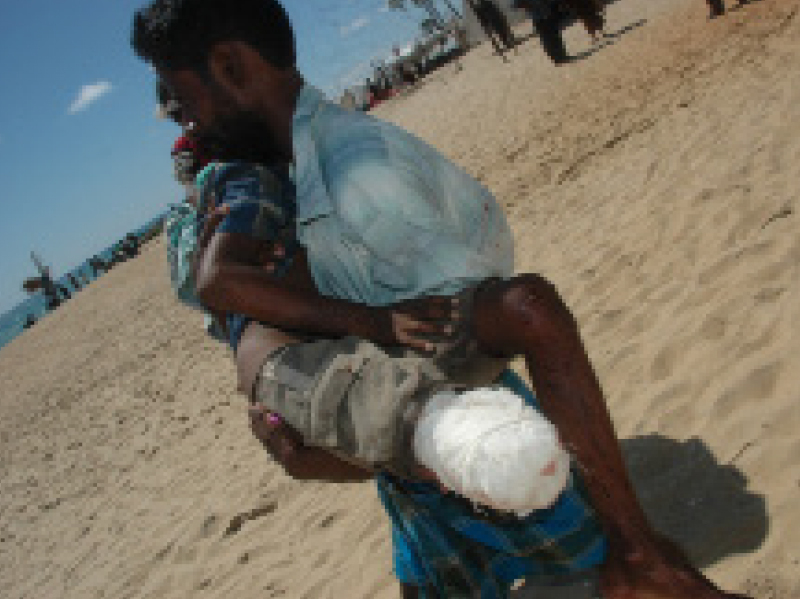 The last months of Sri Lanka’s long running civil war saw an unprecedented slaughter of minority Tamil civilians. The United Nations now estimates between 40-70,000 people died in five months in a tiny corner of the north-east of the island. That makes Sri Lanka one of the bloodiest wars this century and yet the least reported of mass atrocities. 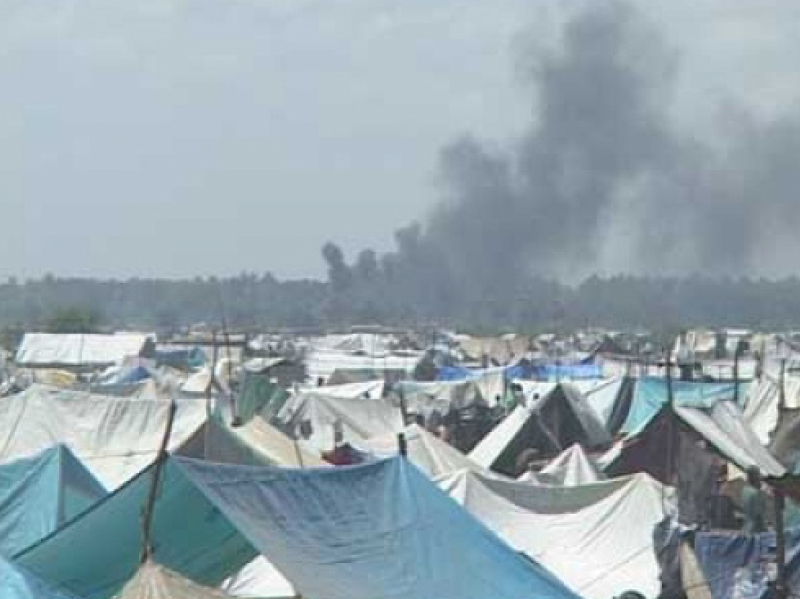 The fighting took place around a series of shrinking “no fire zones” declared by the Sri Lankan government. 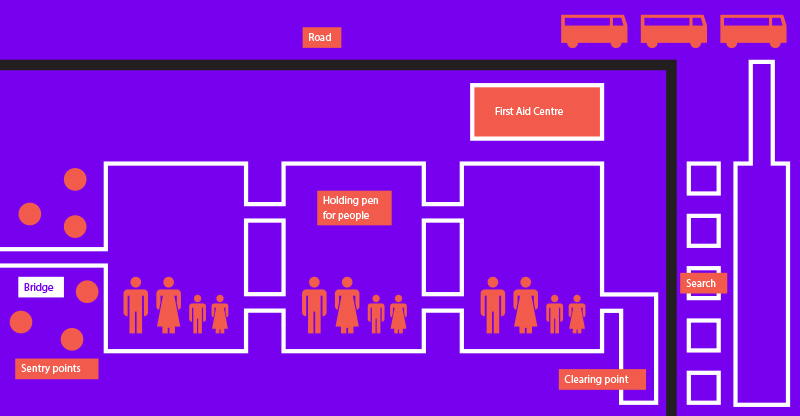 These were designated areas where civilians were told to gather to avoid being harmed. However these three “no fire zones” where tens of thousands of civilians congregated were repeatedly shelled and bombed by government forces. Hundreds of thousands of people were constantly on the move for months, trying to escape the fighting. They finally gathered on a tiny spit of land along the coast. They camped out on the hot sand beaches, digging trenches and chopping up their best wedding saris to make sand bags. 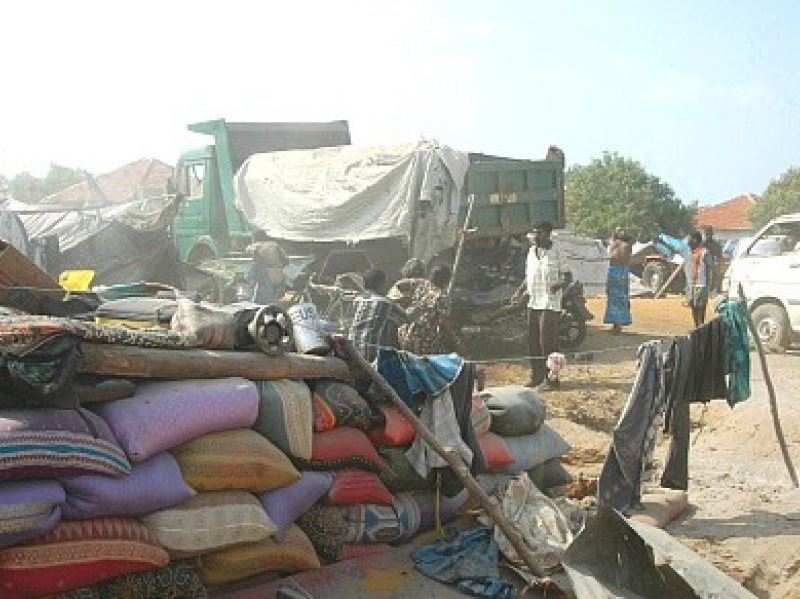 By May 2009 the situation in the conflict zone had become utterly desperate. Every makeshift hospital had been shelled. A handful of doctors were left, doing amputations without anaesthetic or antibiotics which the government refused to allow in. People were starving because the government would not allow enough food in. Civilians were being pounded by supersonic jets and heavy artillery including multi-barrelled rocket launchers. Everyone had witnessed death and few thought they’d survive the carnage. The scale of the tragedy is revealed in a rare letter sent out of the war zone. It came from an elderly Catholic priest, Father Francis Joseph seen in the foreground of this photograph during the war. On 10th May 2009, a Catholic priest inside the war zone, Father Francis, wrote to the Pope in Rome describing what he was experiencing. 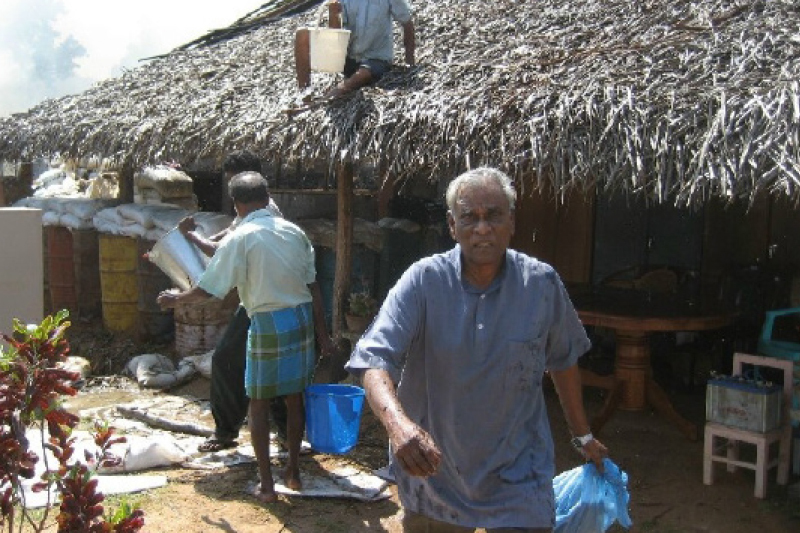 By the time Father Francis wrote his letter to the Pope on 10 May it was already clear that the LTTE were defeated. From once having controlled nearly a third of the island, they now were crammed into an area little more than 3 kilometres square. The LTTE were reportedly running out of ammunition and manpower and were forcibly recruiting civilians who didn’t want to fight. The war only had a week to go. By 14th May discussions began on a possible surrender. A day later, fighters report the LTTE leader sent a message to his cadres saying they could if they wanted try and escape. Some fighters took off their uniforms, laid down their weapons, and mixed with their families and the fleeing civilians hoping they’d pass undetected. The LTTE leadership had to make a choice whether to fight to the end or surrender. They decided that the political wing leader, Nadesan, and his deputy, Pulidevan, should negotiate a surrender and take with them the injured and others who wanted to lay down their arms. In the course of the negotiations for surrender, the two men started sending out messages back and forth to a range of Sri Lankan politicians and diplomats and a journalist. They sought and received guarantees that they would not be harmed. 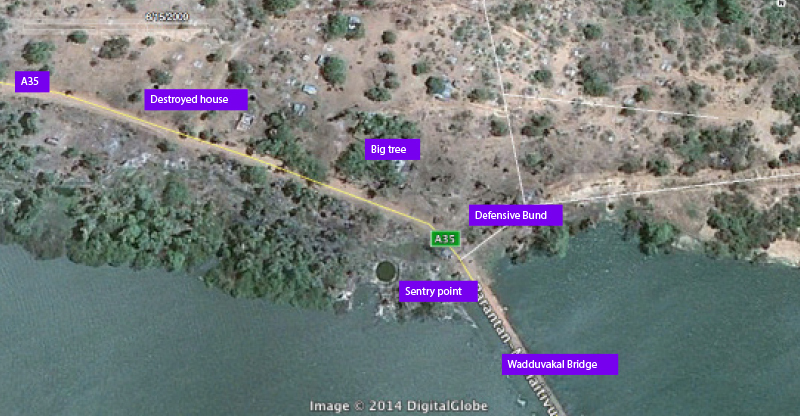 Location of Bunker of Pulidevan and Nadesan as confirmed by survivors. Survivors say the political wing leaders were sheltering in a bunker under this large tree. 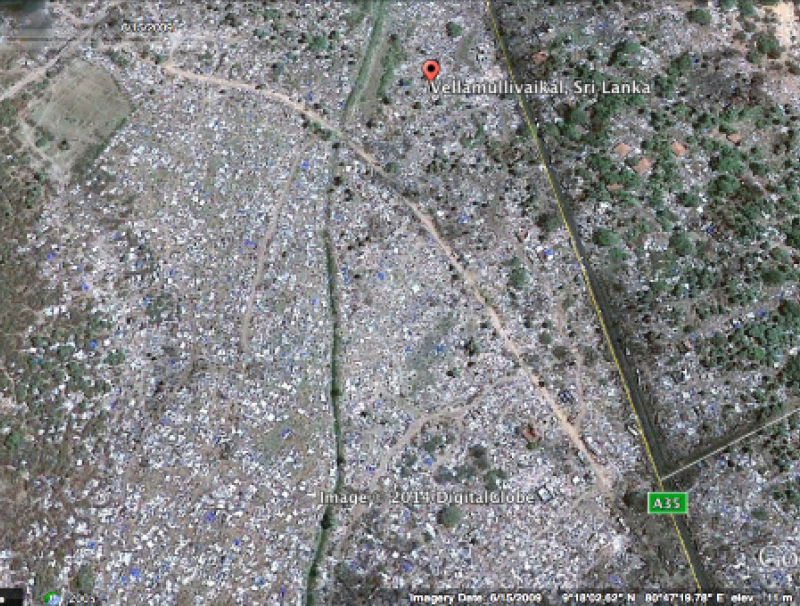 One of the intermediaries was a Tamil MP known to both the LTTE and government officials. His name is Rohan Chandra Nehru. On 14 May 2009 Nehru informed Basil Rajapaksa to be on standby for an LTTE message on a possible surrender. But Basil Rajapaksa sounded disinterested and then didn’t call the MP back for three days. Nehru also tried for two days to contact the UN Secretary General’s special envoy, Vijay Nambiar. He says Mr Nambiar never called him back. Below is a chronological record of some of the phone calls made back and forth to the war zone as well as text messages sent by the Sri Lankan Foreign Secretary as the LTTE leaders negotiated their surrender. 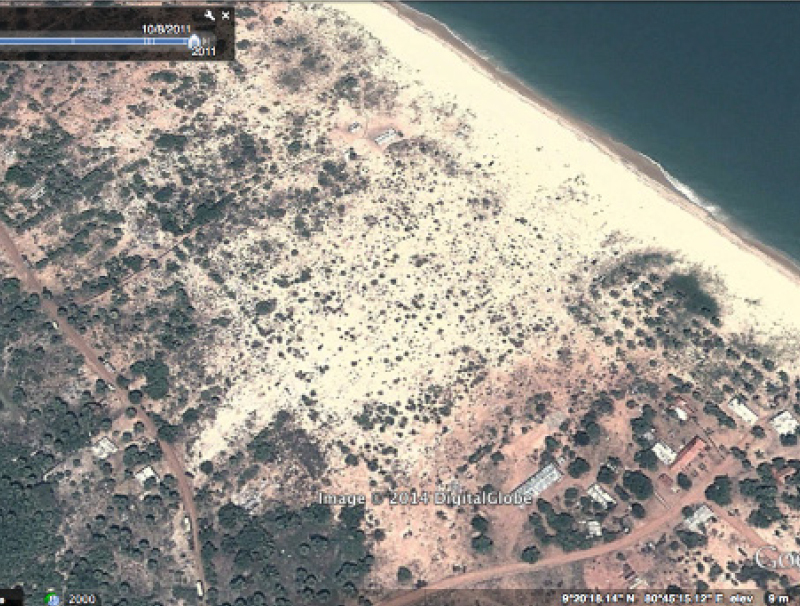 At this point the LTTE still had access to a centralised Internet service working off a satellite base station until at least 14 May 2009; then they appear to have relied on Thuraya satellite phones. Their phone communications reveal mounting desperation and panic. Interlocutors outside the war zone report hearing shelling, gunfire and screaming in the background during the calls. 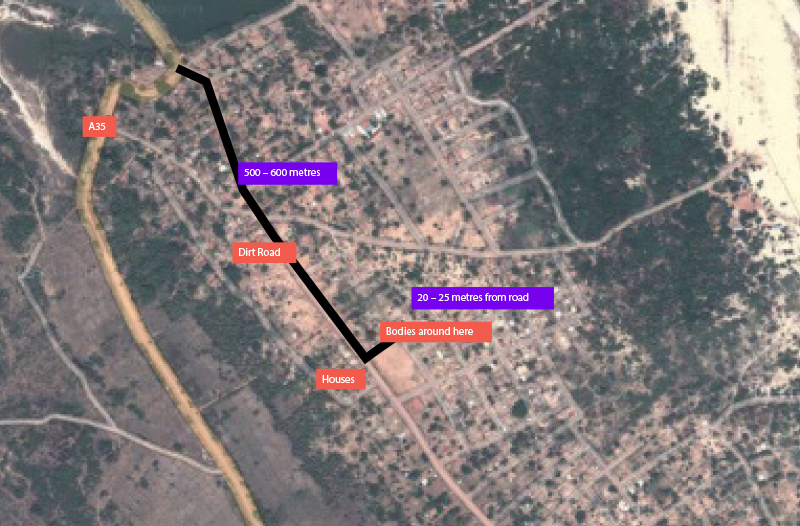 From the 48 hours of communications documented here it is clear the LTTE informed a wide range of officials that they were about to surrender. It’s also clear that the top echelons of the Sri Lankan government agreed to the surrender and provided details on how the surrender should be made. The agreement on the surrender came from three of the Rajapaksa brothers, Mahinda, Basil and Gotabaya Rajapaksa, as well as the Foreign Secretary, Palitha Kohona. Mr Kohona later denied any involvement in the incident despite sending four text messages about the details to the LTTE through an intermediary in Europe. At one point Basil Rajapaksa reportedly spoke directly on the telephone to Nadesan of the LTTE about the surrender just before it took place. 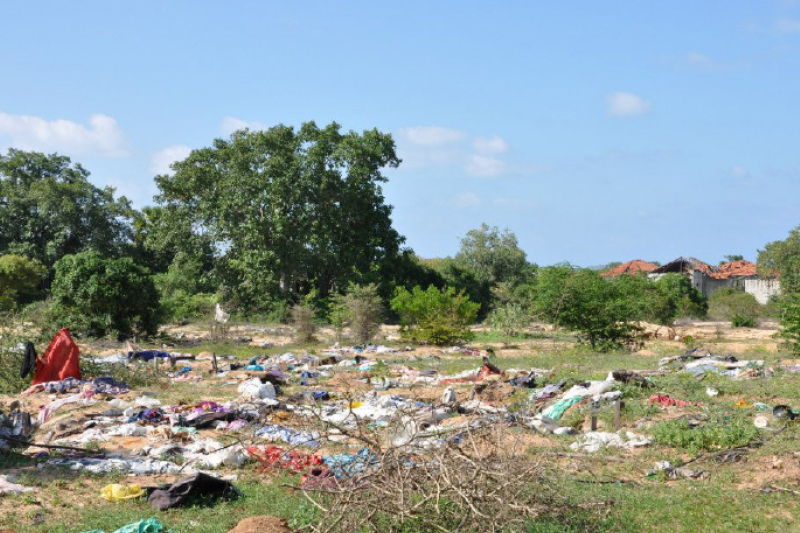 The LTTE political wing leader Nadesan told those he contacted that there were still 22,000 civilians still trapped inside the war zone and 3000 rebels, many of them injured. 1529: Another SMS from Palitha Kohona: “white flag, hands up, walk slowly”. Midday approx: Nadesan calls Rohan Chandra Nehru MP in Colombo. “I will give you an answer around the evening, or anytime, my leader is instructing me, keep your phone free so I can call you”. [Shelling heard in background]. 1830: Nadesan calls Nehru. “We are ready to surrender under the leadership instruction”. The rebel leader, Prabhakaran had given Nadesan and the LTTE permission to surrender. Nadesan tells Nehru to speak to Basil Rajapaksa to arrange, “full security and ceasefire for when we come out.” Nadesan reports heavy shelling in their location with many casualties. 1900: Nehru calls Basil Rajapaksa. He tells him that Nadesan said there were 3000 LTTE cadres (including the political wing) and 22,000 civilians who wanted to surrender as soon as possible. Nehru tells him that the LTTE political wing and others want a ceasefire and security guarantees to surrender. Nehru calls a number of embassies to tell them an agreement has been reached, including Norway, Britain, US. He calls Nadesan’s brother abroad. 1930 approx: Nadesan calls Nehru. Nehru tells him that Basil informed him that the President has accepted their surrender conditions. The conversation is very difficult because of loud shelling. Nadesan says he will prepare everyone to surrender. Nehru tries to call Basil back but his phone is switched off. He tries the President without success. Nadesan calls Sunday Times journalist Maire Colvin in London (the call patched via South Africa). Nadesan says: “We are putting down our arms...We are looking for a guarantee of security from the Obama administration and the British government. Is there a guarantee of security?”. Nadesan asks Marie Colvin to call UN Special Envoy, Vijay Nambiar who is traveling. The first time Nadesan tells Marie Colvin that it will be difficult to persuade the Sri Lankan government to accept a surrender. 0130: Nadesan calls Nehru. He says the army is very close. In the background is shelling and small arms fire and screaming. 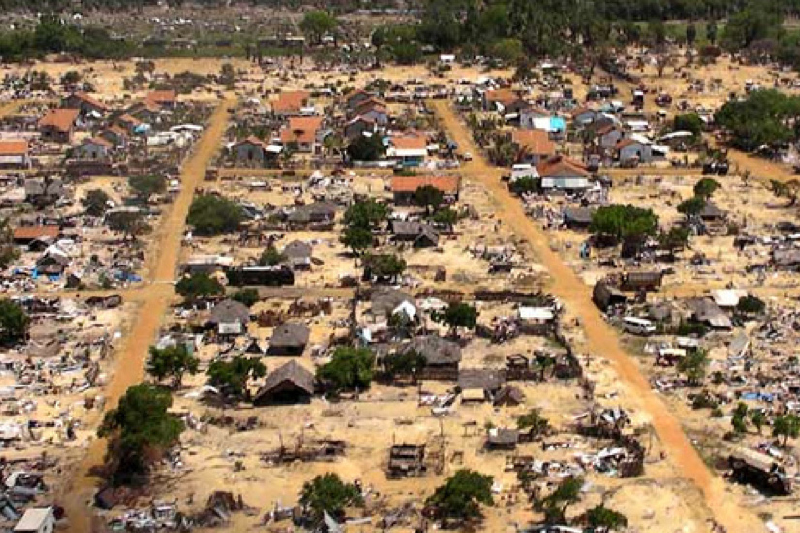 Nadesan again confirms there are 3000 LTTE and 22,000 civilians who want to surrender. 0145: Nadesan calls Nehru to see if there’s any news from the government which there is not. Nadesan says he is in direct contact with Washington. Nehru suggests a white flag. 0330: Pulidevan calls Tomas Stangland in Oslo to ask for help (at midnight Norwegian time). He also calls Tore Hattrem, the Norwegian Ambassador to Sri Lanka. [Press reports that Pulidevan spoke to Erik Solheim that night are incorrect.] Nadesan calls his brother in London to say he’s surrendering; he says there are 1000 injured rebels stranded with him. 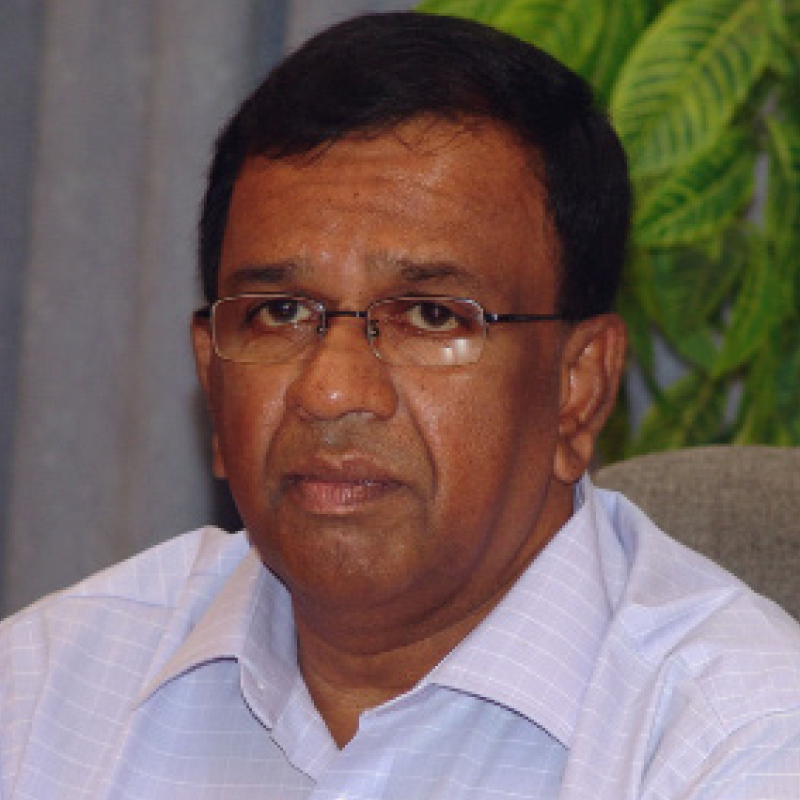 0409: Palitha Kohona is informed by SMS that Pulidevan and Nadesan want to surrender together with approximately 40 LTTE cadres. 0436: Nadesan calls Nehru who relays what Basil said to him at 0156 and instructs Nadesan to hoist a white flag. Nadesan asks if Nehru will be there when he surrenders and he says yes. Pulidevan calls Tomas Stangland in Oslo again - late night Norway time. 0500: Nadesan calls Nehru back to say they are taking heavy casualties. 0511: Nadesan calls Nehru again hoping for news. Shelling and gunfire is still audible. 0528: Nehru calls the US Embassy who tell him the Americans are working on the surrender and are deeply concerned. 0530: Marie Colvin wakes up Vijay Nambiar. He tells Colvin that he’s received assurances from the Sri Lankan President that the surrendering Tigers will be safe and there’s therefore no need for him to go to oversee the surrender. She questions him on the wisdom of this decision. 0545: Marie Colvin calls Nehru. She agrees to call Nambiar again. 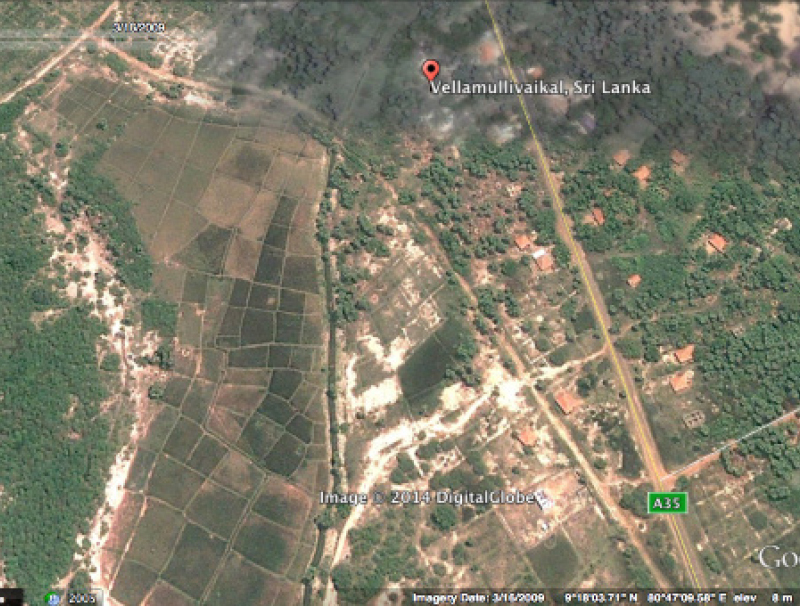 0556: SMS from Palitha Kohona to European intermediary: “Thanks.” in reply to 0409 SMS. 0602: Nadesan calls Nehru for news. There is none. He says the casualties are very heavy. Nehru gives Nadesan the telephone number of Basil Rajapaksa to call directly. They can speak to each other in English. 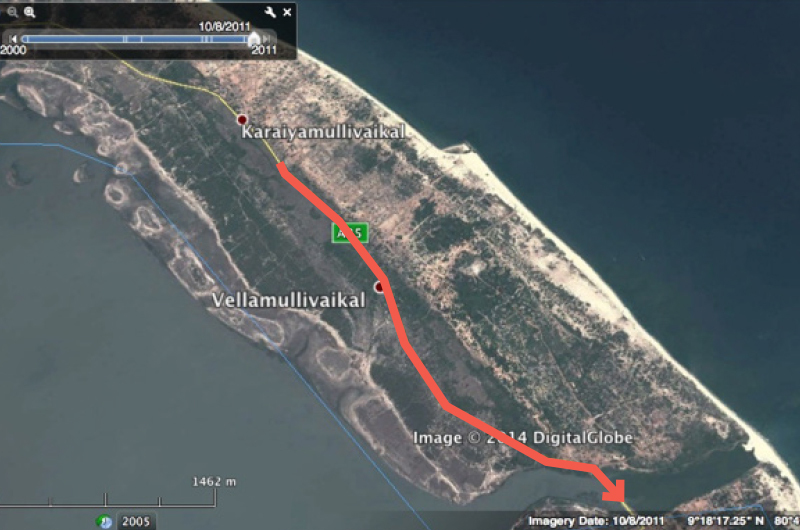 0609: Pulidevan calls his European intermediary to say he’s about to set off for the bridge. He keeps the line open for a couple of minutes and then the satellite connection cuts off. This was most probably his last call though he also reportedly spoke to his sister in law in Canada around this time. 0610: Nehru speaks to President Mahinda Rajapaksa who says he has consulted the defence secretary Gotabaya Rajapaksa and all the plans are in place for the surrender which the government is willing to accept. Nehru offers to go and supervise the surrender but the President says, “No our army is very generous and disciplined. There is no need for you to go to a war zone. You don’t need to put your life at risk”. Mahinda Rajapaksa tells Nadesan to call his brother Gotabaya on his direct number. Nehru is reluctant. The President says: “Ok, speak to Basil”. Mahinda is clear he has given the order to his brother Gotabaya to accept the surrender and protect their lives. 0620: Basil calls Nehru and says he has spoke to Nadesan and told him everything will be ok and his surrender will be accepted. “Waive a white flag and hold it very high” he tells him. Basil gives instructions on the route to take. 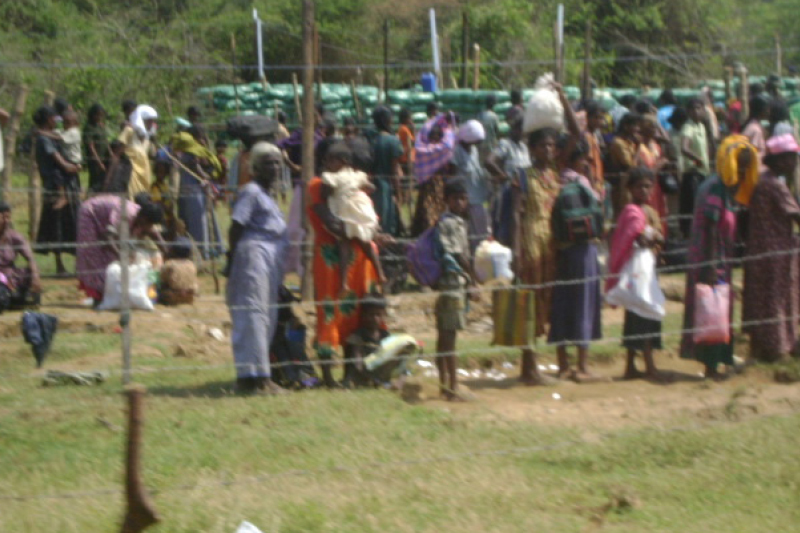 He says the 3000 LTTE are to come separately from the civilians. 0620-30 approx: Nehru calls Nadesan and hears gunfire in the background. He tells them to keep the line open but it drops off. 0656-0700: Basil phones Nehru from his mobile phone. He tells Nehru to ask Nadesan why some LTTE are firing at the army. The implication is Nadesan and group are caught in crossfire. Basil orders Nehru to keep his mouth shut and not to talk to anyone about what has happened, especially internationals. Nehru gives Basil Nadesan’s satelite phone number and suggests he calls him directly. 0800: Johnston Fernando MP tells Nehru that Nadesan and the others are all dead. The source is a friend who is a commando in the security forces. Fernando calls his friend on speaker phone who says the LTTE leaders surrendered, accepted tea and were then beaten. 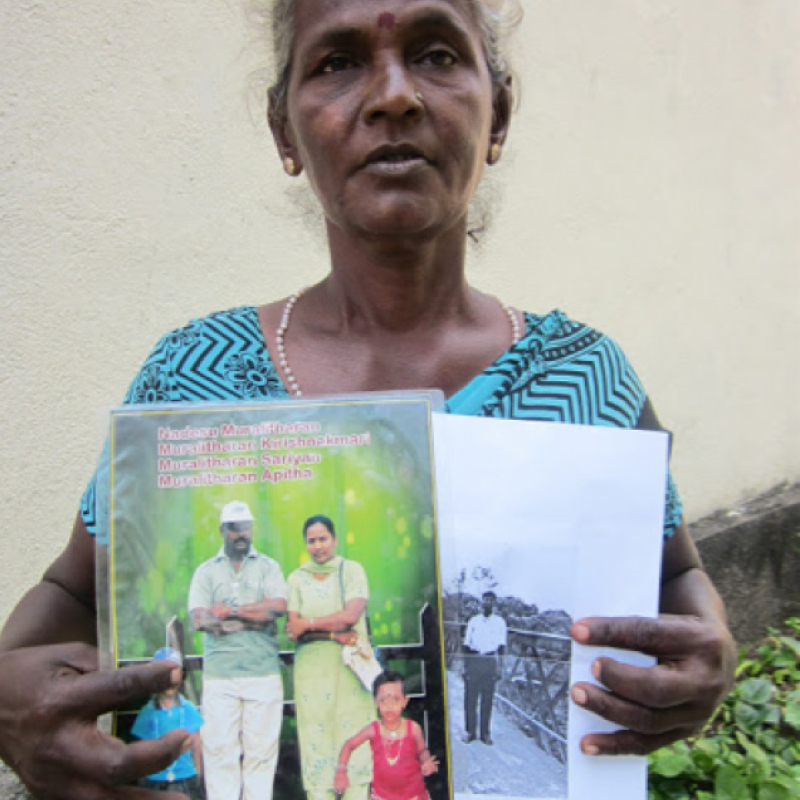 Nadesan’s wife begged them to stop as they had surrendered however they were all shot by the commandos. For days, tens of thousands of exhausted frightened survivors of the war had been pouring over the Wadduvakal Bridge - a long narrow earthen walkway over the lagoon. 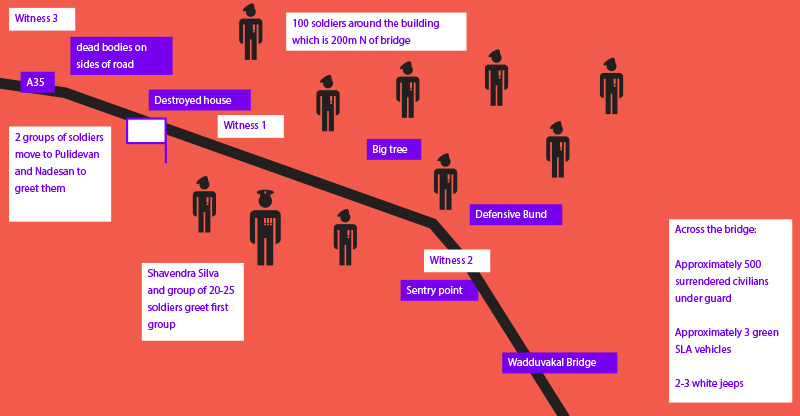 The army controlled the bridge and detained all those who surrendered on the southern side. In the aftermath of the intense fighting there were still corpses lying around. At 0430 on the 18th May, Witness 1 tried to cross the frontline in the dark. He was detained on the northern side of the bridge with a group of fighters and civilians and kept in a destroyed building. Witness 2 watched the surrender from another vantage point. He was behind an earthen defensive embankment (about 2 metres high and 25-30 metres north of the bridge). Witness 2 says several white jeeps arrived and army officers got out of them. He says no gunshots were fired by the LTTE towards the army. Witness 2 says several white jeeps arrived and army officers got out of them. He says no gunshots were fire by the LTTE towards the army. This witness saw Pulidevan and Nadesan and others walking towards the bridge at dawn on 18 May 2009. 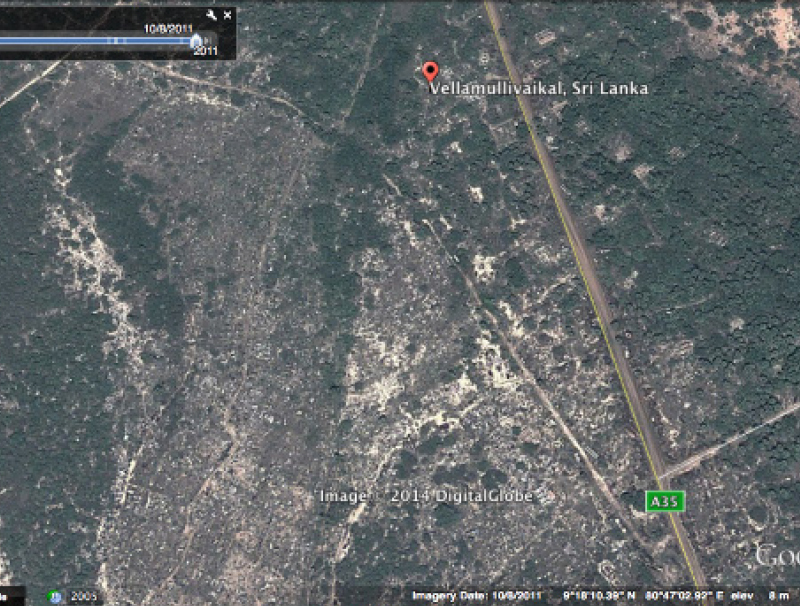 He later met Col. Ramesh (from Batticaloa) who was in civilian dress and moving towards the bridge. As they crossed the bridge in a crowd of people, Col. Ramesh told Witness 4 that the political leaders including Pulidevan and Nadesan had already crossed the bridge carrying a white flag. He said he didn’t think there would be any problems because everyone had surrendered. Group One: Pulidevan, Nadesan, Nadesan’s Sinhala wife Vineetha, Kangan (Nadesan’s head of security). In this group Nadesan held the white flag. Group Two: Illango (police, aka as Ramesh), Witness 3 & 2 men, all in sarongs and shirt. IN this group Illango held the white flag. Group Three: four LTTE cadres. At 0630 am on 18 May 2009, approximately twelve people left the bunkers carrying at least two white flags. All wore civilian clothing - the men were in white sarongs and shirts. Witness 2 was lying on the embankment watching the surrender. He saw that the man carrying the white flag was Nadesan and he also identified Nadesan’s wife and Puidevan in this group. The first batch to cross were met by two different teams of soldiers, including according to an eyewitness, the 58th Division Commander, Shavendra Silva (currently Sri Lanka’s deputy Permanent Representative at the UN in New York), who went up to greet them. 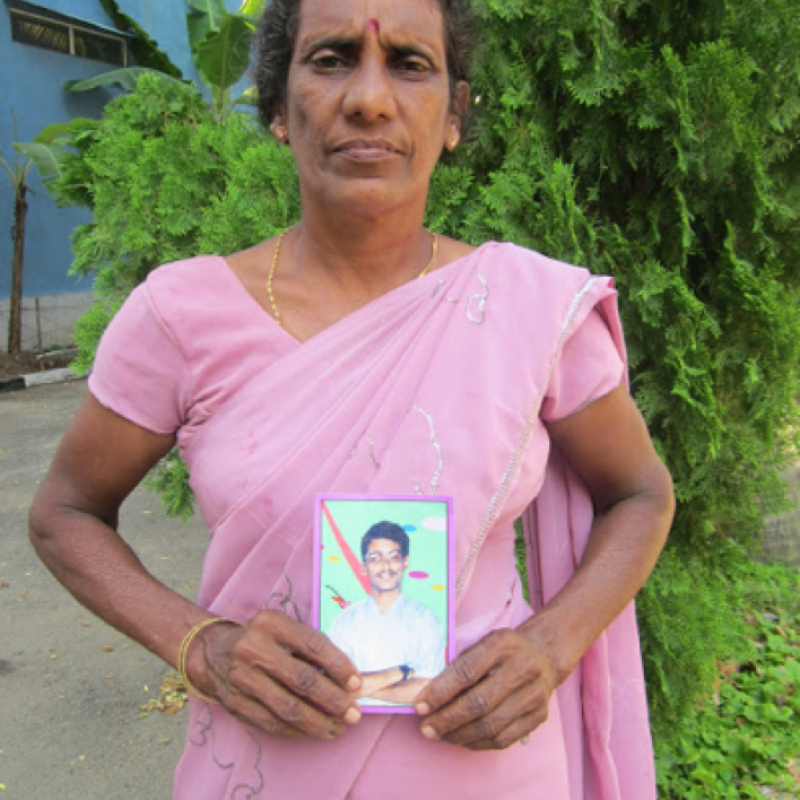 Several witnesses heard Nadesan’s wife shouting in Sinhala to the soldiers. One witness saw the men in the group had their hands held behind their backs by the soldiers though he couldn’t see if they were tied or handcuffed. About twenty metres behind the first group, was the second one led by the police chief Illango (also known as Ramesh) who was also carrying a white flag. Witness 3 was in this group. They passed many dead bodies and could hardly see the lagoon through the dense bushes. Witness 3 saw about 200 troops in the bushes. He then noticed the destroyed building surrounded by about 100 soldiers where Witness 1 was being detained. He confirmed seeing civilians inside this building. The second group watched the first group approach the security forces. Witness 3 saw about 20-5 soldiers in uniform and armed with AK47 rifles surround the first group. He observed Pulidevan and Nadesan’s group being escorted across the bridge surrounded by soldiers. Then his group was surrounded by armed soldiers. The police chief Illango spoke to the troops in Sinhala. Their group was surrounded and escorted in the same fashion across the bridge. 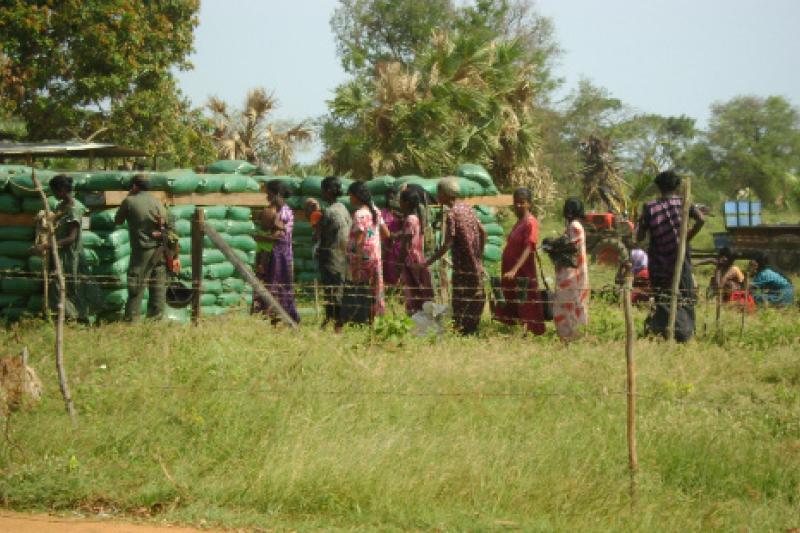 Witness 3 was separated from the others and taken to a sentry post, interrogated and slapped and then loaded onto a bus and taken to a detention camp for former LTTE cadres. “I instantly recognised the bodies of Pulideevan and Nadesan. I knew as soon as I looked at their bodies that they were dead. Both men were lying on their backs in the ditch. These photographs of the corpses or Pulidevan and Nadesan appeared online much later. It is not clear exactly when they were taken. It is reported that a witness inquired after the bodies once he or she heard they were dead and was told the corpses had been burnt. It is unlikely that an autopsy was conducted as the government would no doubt have produced the evidence. Nadesan on the left appears to have burn marks on his chest and Pulidevan also appears to have burn marks as well as a cut on his stomach. In their extensive conversation before surrender neither men reported having any injuries. The Sri Lankan government has produced a number of contradictory explanations for what happened that morning at the bridge. The then foreign secretary Palitha Kohona denied there was any surrender deal and yet he sent at least 4 unambiguous text messages to the LTTE that confirmed the surrender deal - SMS that are produced for the first time in this report. Mr Kohona claimed the LTTE shot their own leaders in the back for daring to surrender against orders. The extensive negotiations about surrender do not indicate a furtive attempt to defy LTTE orders. Three eyewitnesses did not report any firing - indeed one was with the people surrendering and was not shot. Furthermore the government never produced the leaders’ bodies to prove the entry wounds were in the back. In other instances they have been quick to demonstrate evidence of LTTE perfidy but not in this case. In addition, other witnesses say that the LTTE leader sanctioned surrender after 15th May for all his fighters who wanted to take their chances and cross over to the army. 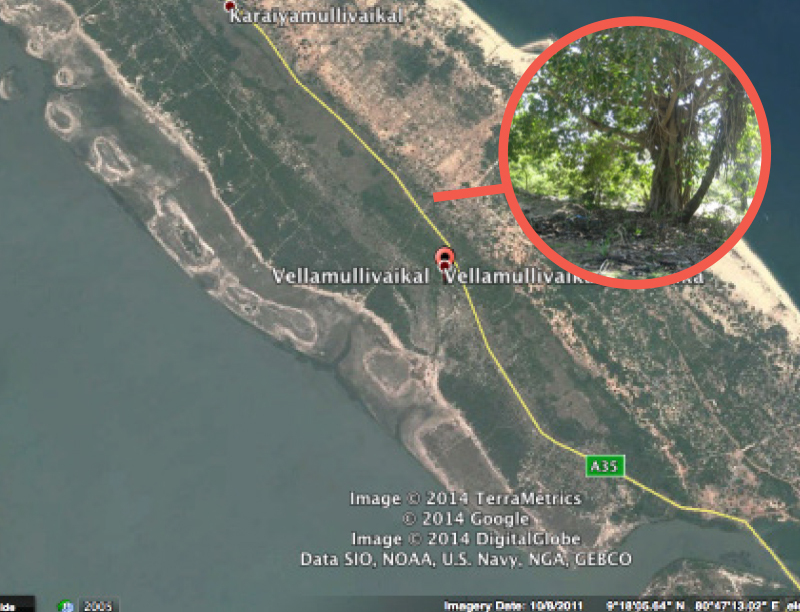 The Sri Lankan military put online a web page claiming responsibility for killing of Pulidevan and Nadesan (by the 58th Brigade of Shavendra Silva whom eyewitnesses place at the spot) but then removed it offline. The defence secretary suggested a young recruit might have shot the leaders in the dark by accident as there was still fighting going on elsewhere. However the communications records and witness testimony show the surrender did not occur in the dark but after dawn. Eyewitnesses say there was no shot fired by either side at the surrender. 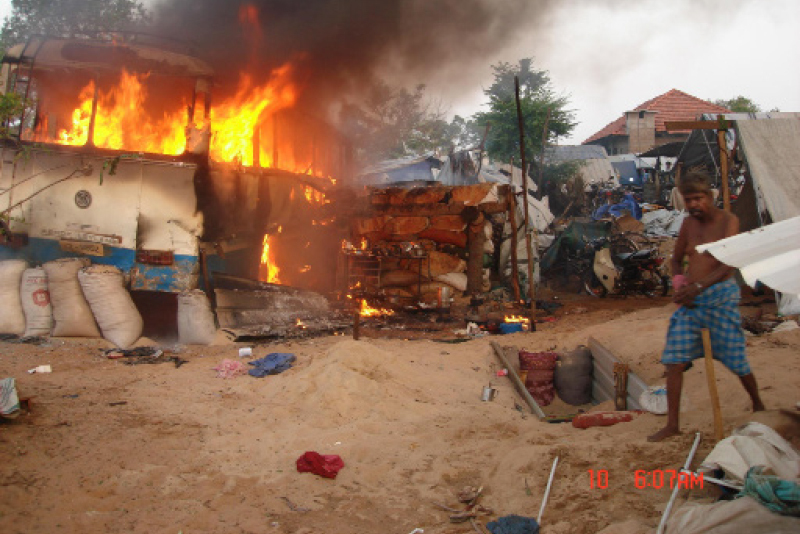 Sri Lankan Government Accounts of Events in the White Flag Incident. TV Reporter SBS: Was there a deal? The former Army Commander, General Sarath Fonseka, in an interview with the Sunday Leader newspaper in Sri Lanka in December 2009, reportedly alleged that the Defence Secretary Gotabaya Rajapaksa had ordered the 58 Division Commander, Shavendra Silva, to kill any LTTE leaders attempting to surrender. In court General Fonseka later denied telling the journalist that the Defence Secretary had ordered the executions of the LTTE leaders surrendering. In 2011 General Fonseka was sentenced to three years in prison and fined Rs.5000 by a court for “propagating a false rumour’ in connection with the original Sunday Leader story. 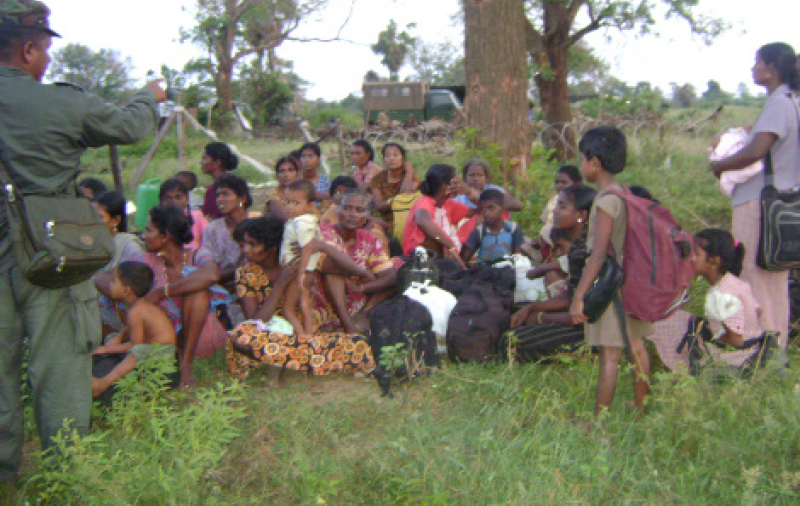 Eyewitnesses say it was not just the LTTE political wing leaders who were targeted, but at least 102 other administrative, financial, political, humanitarian leaders of the LTTE, in addition to unarmed military wing cadres and non-combatants such as children who also surrendered later the same day. There were also other LTTE figures who surrendered in the days before and after 18 May who have disappeared or been killed in the custody of the Sri Lankan security forces. It appears to have been part of a coldblooded plan to wipe out any future Tamil representatives. The names collated in this report are by no means an exhaustive list. Almost all of those who were seen unarmed and in the custody of the security forces have never been heard of again after surrendering on 18 May 2009. 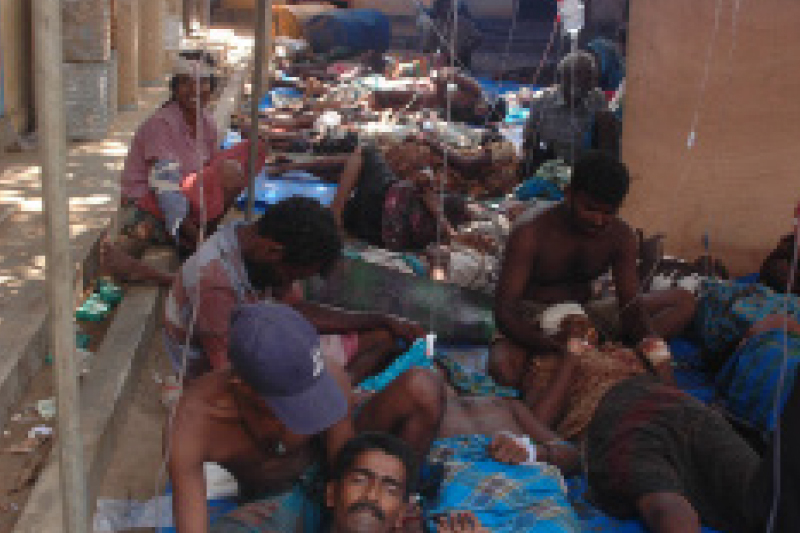 The onus is on the Sri Lankan government to explain what happened to these people. 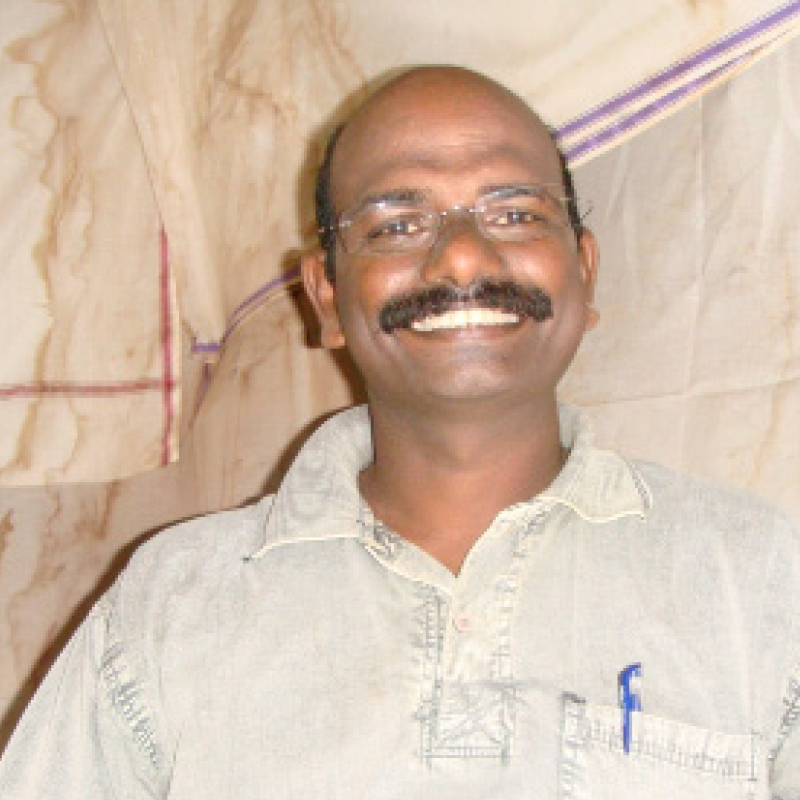 Father Francis, the priest who wrote to the Pope in desperation, disappeared without trace on 18 May 2009 when he escorted a group of about 40 LTTE members to surrender. He was a well known figure in LTTE areas and several eyewitnesses now out of the country saw him getting on a bus under the custody of the Sri Lankan military. Even the influential Catholic Church has been unable to get any word of what happened to their priest. Once people crossed the bridge they were herded into pens, secured with barbed wire, to be searched and screened. 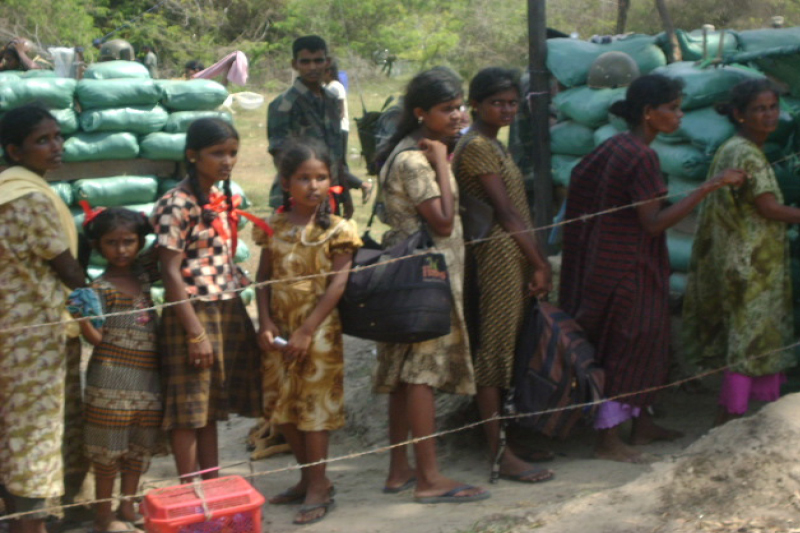 Suspected LTTE fighters were separated like these women fighters identifiable by their short hair which marked them out. 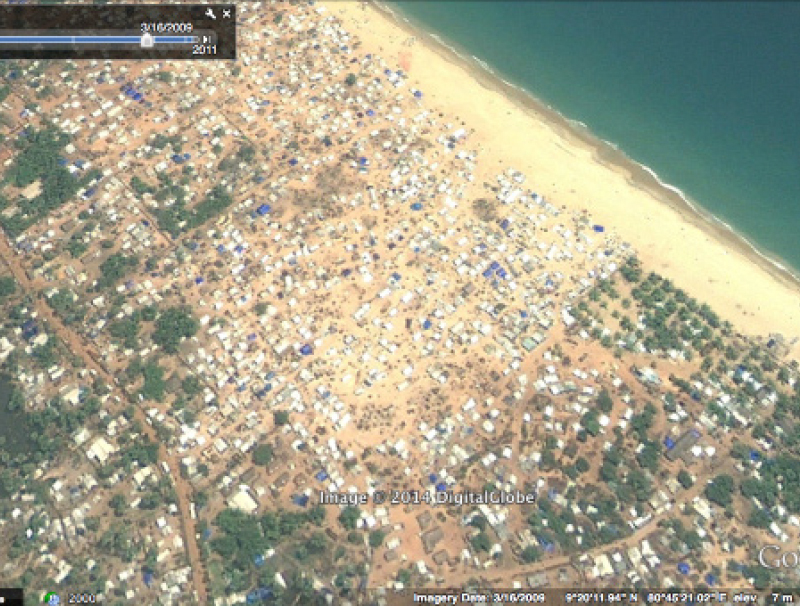 Displaced people in tents camped on the beach in the “No Fire Zone” in March 2009 as seen on Google Earth. 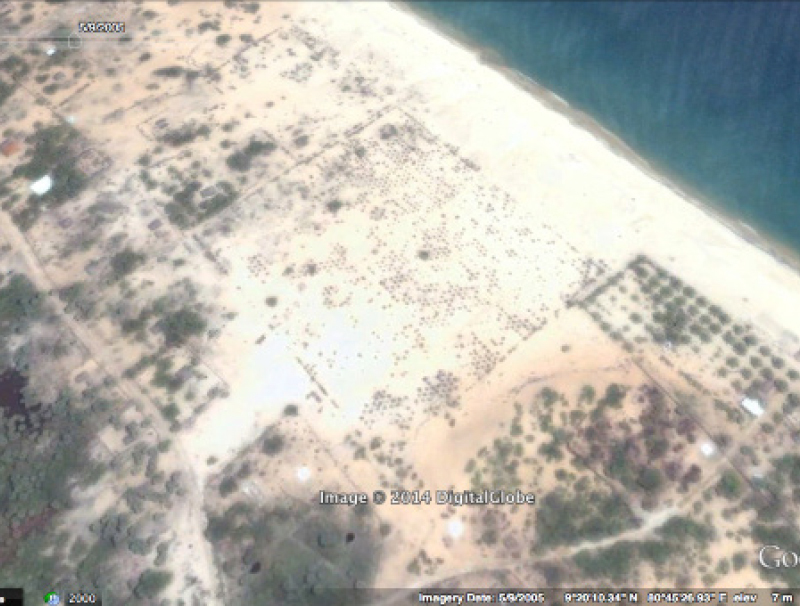 The aftermath of the war as seen by Google Earth in June 2009. NOTE on Photographs: Most of the photographs and videos used have not been forensically authenticated by this project. However the pictures of 12 year old Balachandran and some of the pictures of Isaipriya were independently authenticated in the past by Channel 4. 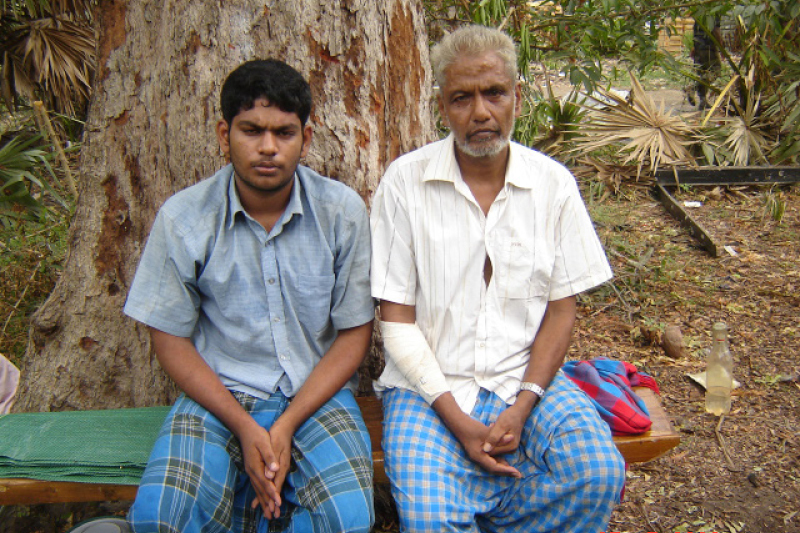 LTTE Military Commander, Colonel Thambirasa Thurairasingam (Ramesh) also surrendered on 18 May 2009. On 22 May 2009 he was questioned, and died later that day.